What If Bluetooth device disconnects automatically in your realme smartphone? Learn how to fix the issue. When Bluetooth device disconnects automatically. Bluetooth allows you to transfer files between Bluetooth accessories. 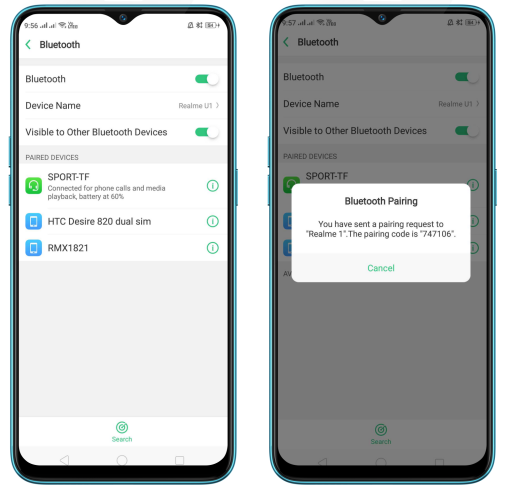 If Bluetooth device disconnects automatically on your realme smartphone, do the following. 1. Bluetooth accessories can be paired and connected within 10 meters. Make sure that your Bluetooth accessory and realme phone are close to each other. 2. Metal or other obstructions will affect the connectivity. Remove any objects that may block the connection. 3. Check for any interference, such as Wi-Fi signal, mobile phones, and more. 1. Unpair the Bluetooth accessory, put it back in discovery mode, then pair and connect it again. 2. Check the files that are being transferred. 3. Check if the files are corrupted or too large. Try to transfer other files, and see if you fixed the issue. •Check that your Bluetooth accessory is on and fully charged or connected to power. •Try to pair your accessory with some devices but not your Realme smartphone. Restart your phone and test again. Press and hold the Sleep/Wake button until the Slide down to power off message appears. Drag the power icon down to turn off the phone. To turn the phone back on, press and hold the Sleep/Wake button until you see the Realme logo.